It”s too soon to give up your life in Korea! When first arriving in Korea, or in any new country for that matter, it is only natural to want to try and fit in–or at least try not to offend anyone with your lack of knowledge of the local culture. As one will soon learn, playing the role of the ignorant foreigner gets old fast, and in fact may have the effect of prolonging the amount of time it will take to start feeling comfortable. 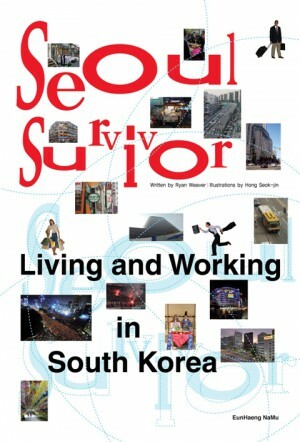 Within just over 200 pages Ryan Weaver”s book, “Seoul Survivor,” provides the practical information needed to live in and navigate Korea”s dynamic cityscape, the cultural insight to avoid embarrassing social blunders, adapt to the Korean work environment, and become well-informed of the country”s most pressing social issues. Learning about a host country’s culture, etiquette, and social/business practices can play an important role in speeding up the acclimation process. Unfortunately, however, while learning about one’s new environment may be adequate for some of us, individuals traveling abroad to work, study and live often neglect a very important part of the expatriate puzzle, and that is themselves. If you really want to be happy and successful in your new home you must also make a careful self-examination in order to fine tune and develop new skills for dealing with uncharted obstacles and personal issues that may be waiting for you around the corner. It takes an extraordinary person, on many levels, to make a seamless transition to living in Korea, but don’t worry, there is hope for the rest of us. Also covered in this book is pertinent information one may use to discern whether or not he or she is the right kind of person for such a challenge of living abroad. Equipping readers with information and tips to both better anticipate problems that one may have while living and working in another country, as well as providing ways to mitigate stress, and live happier. For Korean readers, learn about what makes life for foreigner residents in Korea challenging so that you can help them become a more productive part of the workforce and active members in the community. 세계의 어느 나라이든 타국에서 생활하기로 결정하고 현지에 갓 도착한 ‘외국인’의 입장에서는 그곳에 잘 적응하는 일이 무엇보다 시급할 것이다. 적어도 현지 문화에 대한 무지로 인해 누군가와 부딪히는 일조차 두렵기 마련이다. 익숙하지 않은 땅에 첫발을 디딘 사람이라면 누구나 ‘무지한 외국인’으로 살아가는 것이 얼마나 피곤한 일인지 금세 깨닫게 된다. 그리고 스스로 새로운 세상에 직접 부딪치며 녹아들지 않는다면 결국 자신은 ‘패배자’가 되어 그곳을 떠나야 한다는 사실도 말이다. 대한민국 역시 외국인들에게 결코 만만한 나라가 아니다. 오랜 역사를 통해 이루어진 독특한 문화와 사회구조는 쉽게 체득할 수 있을 만한 것이 아닐뿐더러, 이처럼 광범위한 지식과 정보를 얻을 만한 매체나 방법도 찾기 어렵기 때문이다. 따라서 이러한 과정을 모두 거친 외국인이 들려주는 ‘대한민국에서 살아남기’ 안내서라 할 만한 라이언 위버Ryan Weaver의 신간 《Seoul Survivor》(은행나무刊, 전문 영어)는 한국에서 살고, 일하고, 즐기는 외국인들에게 더없이 반가운 조력자가 될 것이다. 이 책에서 저자는 역동적이고 쾌활한 한국의 수도 서울을 중심으로 한국과 한국인을 보다 깊이 이해하고 제대로 즐길 수 있도록 실용적인 정보와 지식을 제공하고 있다. 독자들은 이 책을 통해 기본적인 역사와 문화뿐 아니라 한국의 비즈니스 환경과 주요 사회적 이슈들에 대해서 쉽고 재미있게 이해할 수 있으며, 쇼핑과 여행 등 여가생활에 필요한 정보에 이르기까지 폭넓은 지식을 습득할 수 있다. 이방인의 입장에서 볼 때 한 나라의 문화와 사회적 규범, 그리고 기업·비즈니스 환경 등을 배우는 것은 새로운 환경에 적응하는 데 있어 중요한 전제조건이다. 물론 어떤 이들에게는 새로운 환경에 대해 배우는 일이 입맛에 잘 맞을지도 모르지만, 불행히도 일이나 학업 등을 위해 해외로 나가는 사람들 중 많은 수가 이러한 점을 소홀히 한다. 그것이 얼마나 중요한지 망각한 채 말이다. 하지만 진심으로 제2의 고향에서 행복하고 성공적인 삶을 이루어내고 싶다면 자신이 주파수를 올바로 맞추고 있는지 신중하게 검토해야 한다. 또한 언제 어디서 닥칠지 모를 미지의 장애물을 피할 수 있는 ‘신기술’을 익혀야 한다. 문제는 배우고자 하는 생각이 있음에도 배울 수 있는 방법을 찾기 어렵다는 점이다. 어떻게 하면 좀 더 빨리, 그리고 좀 더 효과적으로 새로운 사회의 훌륭한 일원으로 변신할 수 있을까? 이 책의 저자 라이언 위버는 자신도 한 번 실패했었다고 고백한다. 처음 한국에 도착한 후 그의 쌍둥이 형이 성공적으로 대한민국에 정착했던 반면, 저자는 이 생경한 나라에 녹아드는 데 어려움을 겪었고, 그는 결국 한국을 떠나 고향인 캐나다로 돌아갔다. 그러나 그는 자신의 실수를 깨닫고 다시금 한국으로 돌아와 새롭게 시작했다. 그리고 한국에 머물면서 외국인들이 이곳에 뿌리내리지 못하고 실패하는 원인에 대해 탐구하였다. 그는 자신이 직접 겪었던 경험과 수집한 자료들을 바탕으로 한국에 머물고 있는 외국인들이 꼭 알아야 유용한 정보들을 정리해 외국인에 의한 외국인을 위한 대한민국 지침서를 완성했다. 《Seoul Survivor》는 총 8개의 장으로 구성되어 있다. 1장 ‘Korea at a Glance’에서는 한국의 역사와 북한, 현대의 경제 성장 및 교통에 이르기까지 개괄하고 있고, 2장 ‘Getting off on the Right Foot’에서는 인사와 소개 등 한국에 처음 도착했을 때 가장 쉽게 느끼게 되는 사회·문화적 차이에 대해 설명하며 외국인들이 갖고 있는 한국에 대한 여러 가지 잘못된 선입견에 대해 지적한다. 3장 ‘Navigating the City”는 서울을 중심으로 교통환경과 주거방식 등 실용적이고 기초적인 정보에서부터 추천 관광지까지 아우르고 있으며, 4장 ‘Getting Settled into a New Lifestyle’은 한국의 음식 문화와 더 나아가 다채로운 문화생활과 쇼핑을 즐길 수 있는 지역들을 소개하고 있다. 5장 ‘Korean Culture in Focus’에서는 인정, 효, ‘우리’ 의식 등 한국 사회와 문화에 깊은 영향을 미치고 있는 요소들을 하나씩 짚어가면서 설명하고 있다. 또한 6장 ‘Korean Society’에서는 한국 사회에 유교가 미친 영향을 비롯하여 다른 나라와 구별되는 한국 사회의 고유한 특징에 대해 언급하고 있고, 7장 ‘Social Issues Facing Koreans’에서는 이혼에서 자살, 고령화 문제 및 반미감정에 이르기까지 오늘날 한국에서 불거지고 있는 다양한 이슈들에 대해 설명하고 있다. 마지막 8장 ‘Before You Book Your Flight’에서는 외국인들이 타국에서 살아갈 때의 자세에 대해 다시 한 번 정리해주며 긍정적이고 열린 마음의 중요성을 강조하고 있다. 저자는 보다 효율적이고 실수를 줄이면서 ‘빠르게’ 그리고 ‘제대로’ 한국에 정착하는 것은 한국과 한국인을 올바로 이해하는 데서 시작한다고 주장한다. 한국에 갓 도착한, 혹은 한국을 방문하거나 체류하고자 하는 외국인 독자들을 위해 쉽고 실용적으로 구성된 대한민국 생활 안내서인 이 책 《Seoul Survivor》는 외국인 독자들에게 대한민국에서의 ‘성공적’이고 ‘다이내믹한’ 삶을 위한 토대가 될 수 있을 것이다. 그리고 한국인 독자들에겐 오늘날 대한민국이 외국인의 눈에 어떠한 모습으로 비춰지고 있는지, 그리고 그들을 도와 하나의 공동체를 꾸려갈 수 있는 방법이 무엇인지에 관한 또 다른 시각을 제공해주는 색다른 가이드가 될 것이다. 2. North Korea: Is There a Threat of War? 5. Can You Find Korea on a Map? 1. Why Are Koreans So Competitive? 5. Korean Politics: Why So Much Fighting? 2. Will You be Able to Cope? among foreign nationals living in Seoul for his thesis. in Canada, while Ryan”s twin brother and his wife reside in Seoul. 라이언 위버는 모국인 캐나다에서 경제학을 전공했다. 졸업 후 2003년 처음 한국을 방문해 1년 반 가량 머물며 영어강사로 일했다. 2005년에는 한국을 떠나 동아시아의 여러 국가를 여행했고, 미국에서 경영학 석사학위를 받은 후 ‘서울에 거주하는 외국인들이 한국에 적응하지 못하는 이유’에 관한 논문의 자료 수집과 작성을 위해 한국으로 돌아왔다. 현재 한국어를 공부하며 박사학위를 준비하고 있으며, ‘한국의 유교적 관습과 문화가 사회와 경제 발전에 미치는 영향’에 관한 논문을 준비 중이다. 그의 부모와 여동생은 캐나다에 거주하고 있으며, 얼마 전 결혼한 그의 쌍둥이 형이 서울에서 살고 있다. 한국정책방송(KTV)의 "업그레이드 코리아"라는 프로그램에 [Seoul Survivor: Living and Working in South Korea]의 저자 라이언 위버와 그의 쌍둥이 형(데미안)이 출연했습니다. 3. 24 (수) 밤 10시 반에 첫 방송되었고, 한국정책방송(KTV) 인터넷 사이트에서도 보실 수 있습니다.